Scotland has a global reputation for potato research, and as a producer of quality, disease free, seed potatoes used by farmers. Many people would think that the tattie is a true Scottish plant. The truth is that it originated in South America, probably in the high Andes somewhere in the region of Peru and Bolivia. 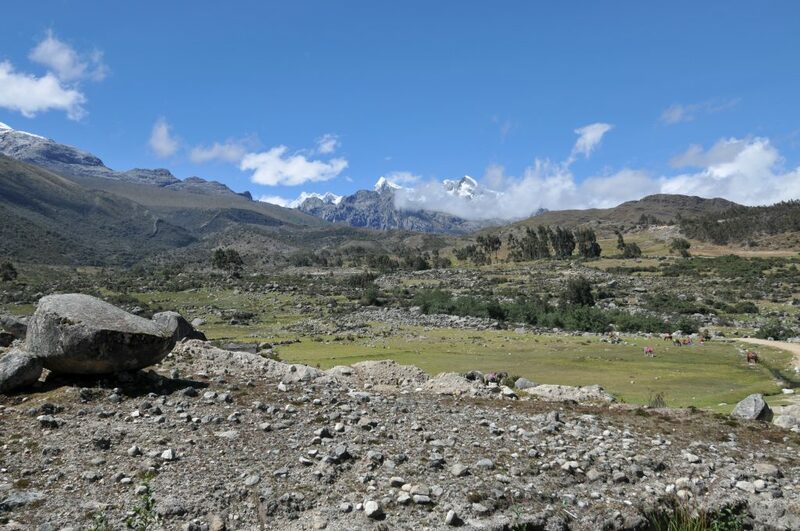 The high Andes in South America are the original home of the potato. Given its South American origin it seems odd that a wild hybrid potato found in Mexico should be named after Edinburgh. 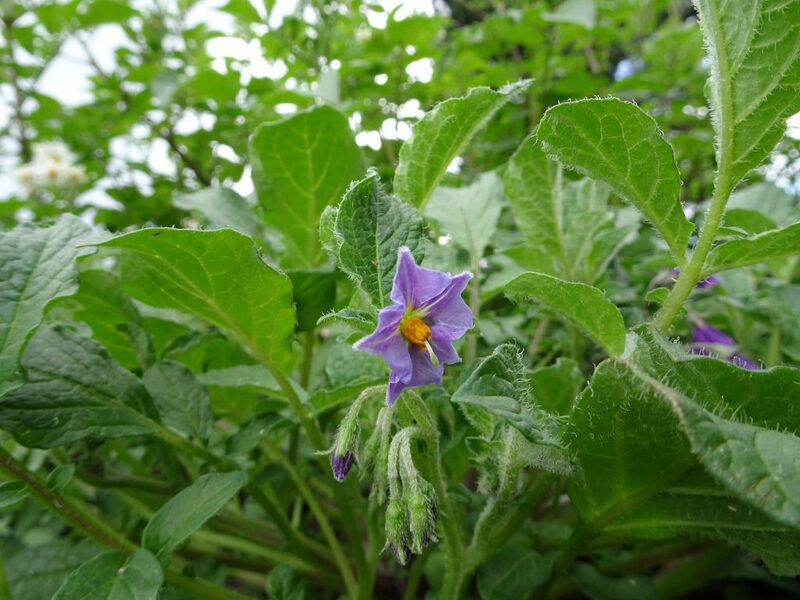 The plant is called Solanum x edinense and it is the product of natural cross pollination between domesticated potatoes and the wild Mexican species Solanum demissum. Solanum demissum – a Mexican species that has contributed blight resistance to the cultivated potato. The explanation for this curious choice of name is that the French botanist Francois Berthault, who was a specialist in the potato family, named the hybrid in 1911 using specimens from RBGE. To reflect the source of the plant material he studied Berthault chose the name edinense, the Latinised form of Edinburgh. 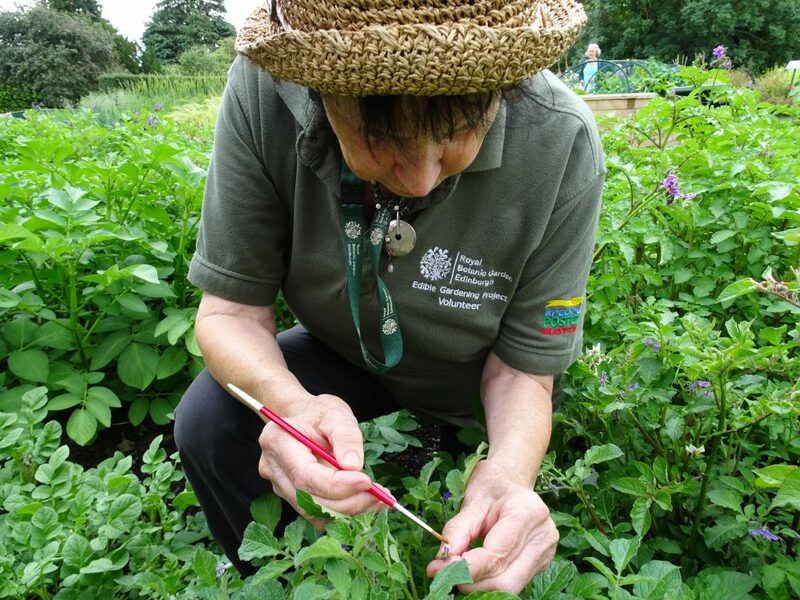 When we started planning for a display of wild potatoes at the Botanics using plant material held in the Commonwealth Potato Collection at the James Hutton Institute we realised that the opportunity existed to recreate the Edinburgh potato. All that was required was the wild Solanum demissum and some fertile cultivated potatoes to cross it with. 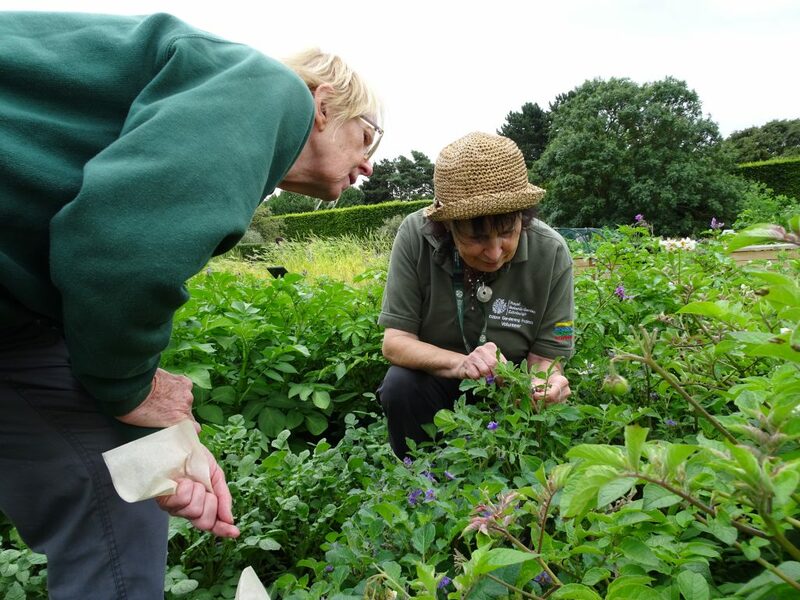 Jan and Liz conducting controlled crosses using Solanum demissum as the mother plant. SASA provided a selection of cultivated varieties known for high fertility. Choice of varieties for potato breeding projects is important as the complicated genetic heritage of the potato means that many familiar modern varieties are sterile and of no use for breeding. ‘Buzzing’ pollen from a potato flower using an electric buzz pollination device. Pollen is visible on the glass slide. Plant breeding is work that requires patience, steady hands and meticulous record keeping. Edible Gardening Project volunteers Jan and Liz took up the challenge of trying to recreate the Edinburgh potato. So far there have been crosses conducted using both species as mother plants. This is important as some hybridisations work best when one of the two species involved is the mother. 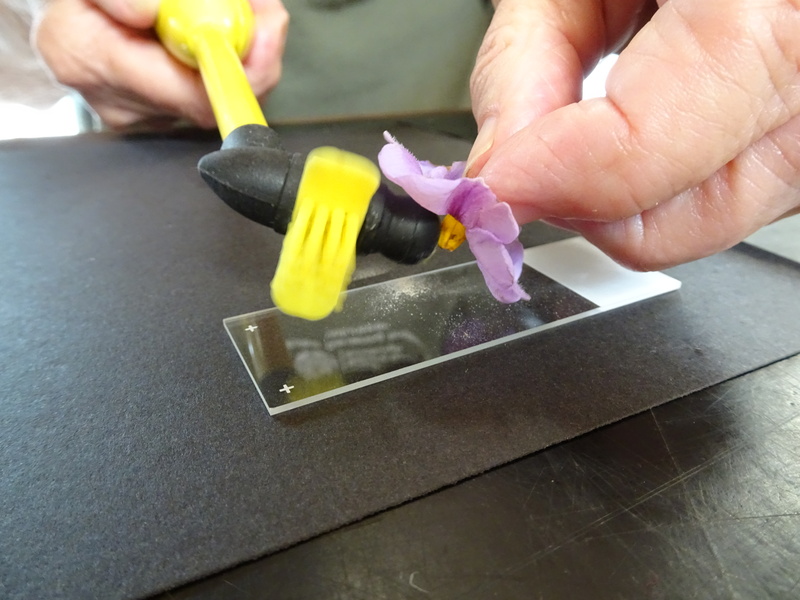 Jan applying pollen to a prepared flower with a fine paint brush. In advance of pollination the flowers anthers are removed to avoid self-pollination. We won’t know if we have been successful until next year when the resulting seeds are germinated and have grown sufficiently to start displaying a mixture of characteristics of the two parents. Before then there is a lot of work to be done carrying out controlled crosses, harvesting fruits and extracting seeds.